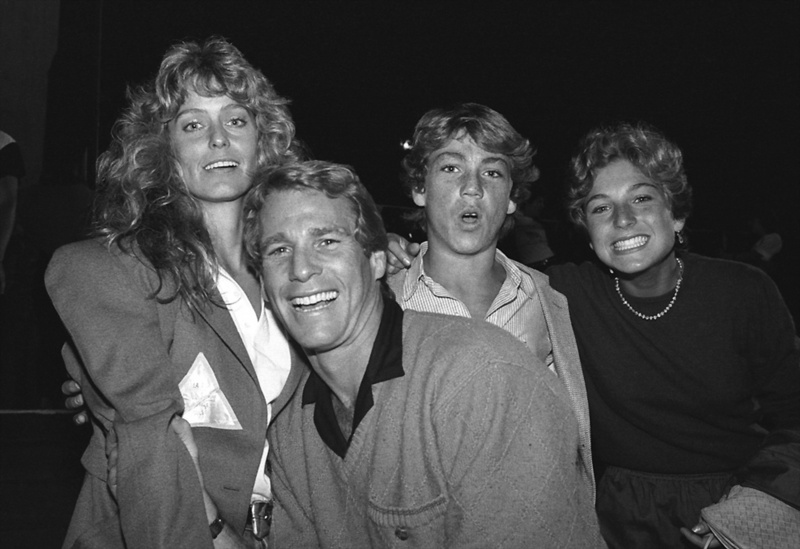 I was hanging out backstage at a Rolling Stones concert when I spotted Farrah Fawcett with Ryan O' Neal. Back then, Farrah was a superstar on Charlie's Angels and she was on the cover of everything. The rumor going around, at that time, was that she had been dating Ryan O'Neal. No one really believed it, but the National Enquirer was adamant about the story and was watching for the first photo. Farrah, Ryan and his kids, Tatum and Griffin were on their way to their seats in the VIP section, just off the side of the stage. I only had only a moment to get this photo before they were lost in the crowds. I approached Ryan and asked for the photo. He totally blew me off and just kept walking past me. Suddenly he turned around and said to me "No one ever asks me if they can take my photo." I was a bit shocked. "Since you were kind enough to ask, go for it, but just one photo," Ryan said. I set up the shot and actually knocked off a couple of frames. I thanked them and off they ran. What made this photo so interesting and marketable was the fact this was two superstars together on a date, photographed for the first time. It only added to the story that he was with his children, including Tatum, who was also a famous and well-respected actress. I sold this photo over and over again. It made about $5,000 - a fortune for a B/W photo back then. I am sure today Ryan might reflect on these as the happiest days of his life. Possibly mine too.